The big question: Will we see this tech outside Oppo's native China? The dual-camera craze is real at Mobile World Congress, but Oppo decided to break from the pack with its own, very clever implementation. 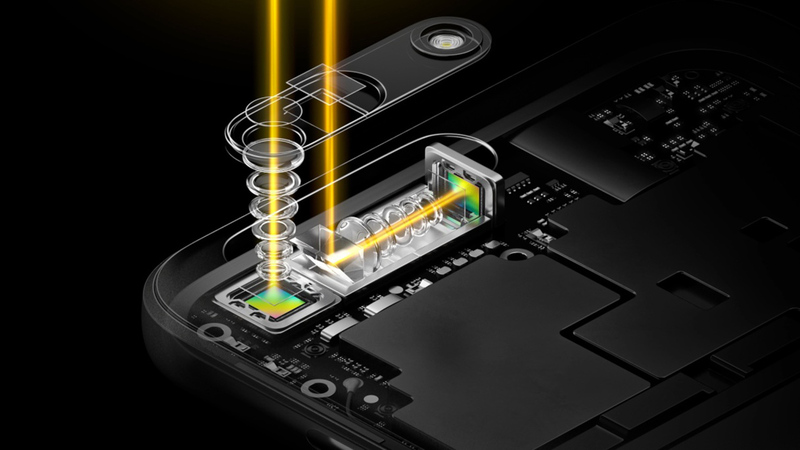 Long story short: the company managed to build a 5x "lossless" zoom system for smartphones using two sensors and a zoom mechanism inspired by periscopes. The latter part is nothing new, of course: 'tis a feature which was once common on compact digital cameras, and ASUS even applied this to its ZenFone Zoom last year. Oppo's implementation, however, takes things up a notch. See, Oppo's telephoto lens is actually mounted horizontally inside the camera module and moves sideways through the top of a phone's body. When you're taking a photo, light enters the module and gets reflected by a prism into that waiting lens. Oppo's optical image stabilization is similarly impressive, the prism and the telephoto lens move around to compensate for shaky hands on the fly. Just keep this in mind: much like the ZenFone Zoom's camera, the telephoto lens itself is capable of 3x optical zoom, and Oppo blends the images from the telephoto lens and a wide-angle lens next to it between 1x and 5x zoom. After 5x, it's just the telephoto lens and digital zoom kicks in at some point between 5x and 10x. One wouldn't normally associate digital zoom with "lossless" quality, but Oppo swears up and down that the system works like a charm. We'll be the judges of that, thanks very much. Chances to such a camera making it to parts of the world Oppo doesn't service -- like, say, the United States -- aren't nil. After all, the company licensed the original design from someone else, so it's possible a more globally minded smartphone maker could take the same route. Then again, Oppo has filed about 50 patents to keep this particular approach locked down, so who knows. Hopefully we'll get lucky someday.